On election day, Peace Corps Volunteers all over Cambodia posted on Facebook that their sites felt “quiet” or “still.” Here in Takeo, I used the same words to describe the calm that took over the city on Sunday. However, this silence did not mean that Cambodians had nothing to say. On the contrary, the polls were packed with voters, many of whom indicated they were ready for a change. International organizations are not satisfied either, with Transparency International saying that it is “very difficult to proclaim this a free and fair election.” In addition to the complaints leading up to election day, which included highly censored media and difficult voter registration processes, there was a long list of voting day concerns, as well. In some cases, voters would show up to the polls, only to find that someone else had already cast a ballot using their name. Some people’s names were left off the list entirely, while a few of the names on the list supposedly belonged to people who had already died. The other issue that was widely covered was that the ink used to indicate that someone had voted was easily washed off, leaving an opportunity for individuals to vote more than one time. 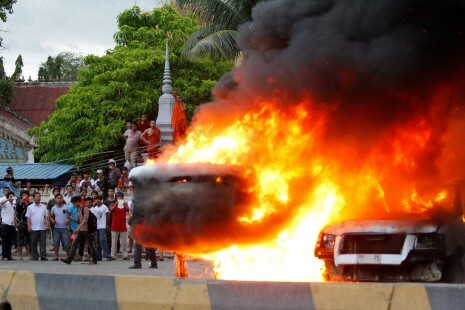 It was these issues that led to a riot in Phnom Penh’s Mienchey district on Sunday, where two military vehicles were destroyed. There were also reports of violence against ethnically Vietnamese Cambodians at a few polling stations. Overall, though, the violence was contained to a handful of specific areas. The violence has been limited, and I would guess that it will remain so. Despite the hard feelings, members from both parties can feel as though they achieved some sort of victory this election day. The ruling party continues to hold the Prime Minister position and maintains a majority in the Assembly, while the opposition party gained 26 new seats and clearly demonstrated the people’s desire to change the status quo. The CNRP is challenging the results, but all in all I believe this was the safest outcome for the country.